Roger Wilson has signed a new two-year contract with Ulster Rugby which will see him remain at Kingspan Stadium until the summer of 2017. The 33-year-old, who can play anywhere in the back row, has represented the Irish province 165 times. Wilson made his Ulster debut in 2003 and his outstanding form saw him named Player of the Year on two occasions. In 2008 he moved to English Premiership side Northampton Saints, before returning to Ulster in 2012. The former RBAI pupil made 117 appearances for Northampton, winning the European Challenge Cup and LV=Cup. He won his only Ireland cap in 2005 against Japan and has represented Ireland A on 11 occasions. This summer he played for the Barbarians in their match against England and was selected in a World XV that took on South Africa in Cape Town. "Ulster Rugby is a great place to be right now so I am pleased to have signed a new two year contract with the province," commented Wilson. "Physically, I feel that I am as fit and well as I have ever been and I am looking forward to making a big contribution over the next two years." "Roger is one of the most consistent and hard-working members of our squad. 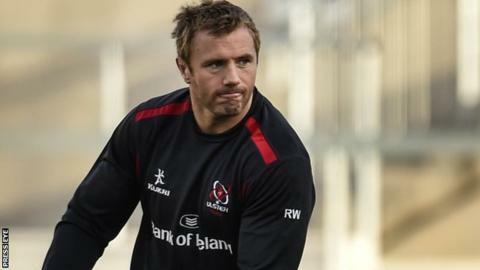 The fact that he has made 165 appearances for Ulster as well as having played more than 100 times for Northampton Saints illustrates his value to the teams he has represented and his considerable durability," said Ulster Team Manager Bryn Cunningham. "His experience of the game is invaluable, especially as we seek to bring through the next generation of players in Ulster and I am delighted that he has committed to the province for a further two seasons."